Property Rental Availability Calendars. Keep up to date - Get a Calendar! If you rent out property in France (or indeed elsewhere) you need to decide whether or not to show availability in your online adverts and on your personal website. There are essentially three camps: I don't have a calendar and I don't want one, I have a calendar but I can't guarantee it will be kept up to date, I have a calendar and ensure it is updated. 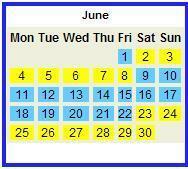 On our site around half of our advertisers choose to display an availability calendar. There are valid arguments both for and against the use of availabilty calendars. Arguments against the use of a calendar can include: I have several online adverts and it is just too time consuming to update all the individual calendars; I would rather not show my availability (or unavailability) so that I receive more enquiries - I can then offer alternative dates to the enquirer; the software is clumsy and it is just too laborious to update my calendar - some calendars require the user to select individually each date, while this can be fine for B&B establishments it is less than ideal for someone offering long lets of several months or even years. Many property rental owners run a combination of online adverts and a personal website. Having constantly to update several calendars can be frustrating and is inefficient. It is obviously preferable to have one calendar which can be replicated on your various adverts. Some sites will allow this, others not. When you have identified an interactive calendar you are happy with, it is well worth contacting your existing advertisers and potential new ones to ask if they will integrate your chosen calendar into their website. Beware of adverts and banners when choosing your calendar. The best calendar should be able to be seamlessly integrated into your website and other online adverts. Where competition is fierce owners displaying an availability calendar will tend to score over those without. We have come across many clients who will simply not entertain properties that do not display a calendar. "If I cannot at least see if the property is available I will simply move onto one of the many other gîtes for rent where a calendar is displayed". We believe calendars are beneficial for both the owner and the tenant. Put yourself in your client's shoes. How would you feel if you contacted an advertiser on the basis that their calendar showed availability only to learn that they were booked and hadn't bothered or had forgotten to update their calendar? In a customer focused market, offering your client what he wants and needs is surely the way to go? On balance then, availability calendars must be a good thing. The question, "Are you free? ", should never need to be asked.